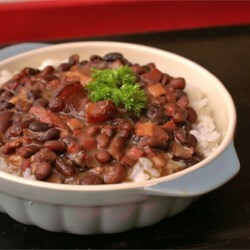 I am brazilian and can tell you this is nothing like Feijoada. For one, the beans MUST be dry because they soak the flavor of the pork as they cook... the pork cuts are totally wrong - they should be smoked and pork loin, baby back ribs, fresh pork sausage and smoked portuguese sausage. Bay leaves and rum are also essential... The side dishes are white rice, oranges and kale, thinly sliced and lightly cooked with garlic. And to finish off, farofa - a corn-meal based mix with glazed onions and olive oil. Where in this world there is coriander in feijoada??!? anyway, sorry guys, you're eating something else that is not feijoada. at all. I am putting down the recipe tonight.